Alexander Gray Associates is pleased to announce Siah Armajani: Bridge Builder, curated by Erin Dziedzic at the Kemper Museum of Contemporary Art, Kansas City, MO. The structure and concept of the bridge has been a major theme of Siah Armajani’s work for decades. In celebration of Armajani’s Kansas City No. 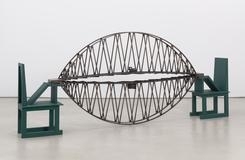 1 (2000), the exhibition Siah Armajani: Bridge Builder for the first time presents the artist’s exploration of the structural and philosophical underpinning of bridges since the late 1960s. In his works depicting bridges Armajani poetically intertwines social science, art, and architecture to compel the significance of cultural connectivity. The exhibition will include drawings from a series inspired by Kansas City and bridge sculptures from 1968 to the present. Based in Minneapolis, Minnesota, Armajani draws on the vernacular architecture of the Midwest, examining the structural and theoretical underpinnings of bridges since the late 1960s. He has worked on a number of high-profile projects throughout his career, including the design for the torch of the 1996 Summer Olympic in Atlanta, the New York Staten Island Tower and Bridge, the Irene Hixon Whitney Bridge in Minneapolis, and the Round Gazebo in Nice, France. His art takes many forms ranging from drawing and sculpture to public projects that spur social engagement. Siah Armajani: Bridge Builder is organized by Kemper Museum of Contemporary Art, and curated by Erin Dziedzic. Ancillary programs, including An Evening with Siah Armajani, Thursday, September 8, at the Kansas City Public Library—Plaza Branch, are scheduled in conjunction with the exhibition. A catalog with accompanying essays by Dziedzic and the artist will debut at the opening talk and will be offered through the Museum Shop.